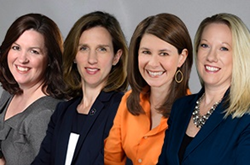 MCI USA is pleased to announce the senior level promotions of Amy Lotz, Sara Meier, Kate O’Donnell and Elisa Perodin. As the company celebrates five consecutive years of exceeding 20% annual growth in its association management and consulting business, these promotions reflect MCI USA’s expansion of capabilities supporting its association and consulting services. MCI USA is pleased to announce the promotions of Amy Lotz, Sara Meier, Kate O’Donnell and Elisa Perodin. As MCI USA continues to offer an increasingly robust suite of services, our staff is fearlessly taking on their new roles. MCI USA is pleased to announce four senior level promotions as the company celebrates five consecutive years of exceeding 20% annual growth in its association management and consulting business. These promotions reflect MCI USA’s expansion of capabilities supporting its association and consulting services. Amy Lotz, CAE, is now Senior Vice President, Client Partnerships & Performance, Sara Meier, CAE, MS.Ed., has been promoted to Senior Vice President, Credentialing, Standards and Professional Development, Kate O’Donnell, CAE, has been named Senior Vice President, MarCom and Brand Strategy, and Elisa Perodin, CMP, CEM, is now Senior Vice President, Events. Amy Lotz, CAE, Senior Vice President, Client Partnerships & Performance, now serves as the chief of staff for all existing full service clients, and continues to lead assessment of new full service management opportunities as well as benchmark current client performance. For nearly a decade, Lotz has directed MCI USA’s longest-tenured consulting client, the Gies Foundation of the American Dental Education Association. Her support of business development and her work in transforming several existing client relationships has been some of her best work during her impressive 15-year career at MCI USA. Sara Meier, CAE, MS.Ed., Senior Vice President, Credentialing, Standards and Professional Development, is creating a new business unit and consultancy around credentialing, standards development and professional education, which supports her previous client experience. Over the course of her decade-long career with MCI USA, Meier has also been serving as the executive director for client, ARIAS•U.S., overseeing all aspects of the organization’s operations and strategic initiatives. She currently liaises with client boards and works with volunteer leaders on maintenance and growth, overall staff management and the client evaluation process. Kate O’Donnell, CAE, is now Senior Vice President, MarCom and Brand Strategy, for all of MCI USA. In the nearly 10 years O’Donnell has been with MCI USA, her work in leading the company’s client and corporate efforts around brand management, marketing and visibility has been extraordinary. O’Donnell also serves as the lead for the strategic consulting business unit, overseeing a team of consultants who provide practical, innovative counsel in key performance areas, converting nonprofit organizational challenges into actionable opportunities. Elisa Perodin, CMP, CEM, Senior Vice President, Events, plays a significant role on the consulting side of the business as well as the events side. Throughout her 10-year career with MCI USA, she has helped to develop and manage new clients, and lead a stellar team of event professionals. Perodin oversees the events department in the coordination of logistics and deliverables for conferences, trade shows, workshops, award ceremonies and other education programs. Spearheading the MCI USA events business unit, which conceptualizes, designs and produces live events for public and private organizations, Perodin continues to grow her team as they put on more and more complex events each year. MCI USA helps companies and associations strategically engage and activate their target audiences, building community and boosting client performance through face-to-face, hybrid and digital experiences that support client business objectives. With US headquarters in the Washington, DC area and growing offices in New York, Miami and Baltimore, MCI USA is rapidly expanding its platform to deliver a robust set of services in its Association and Corporate Solutions portfolios. Find out more at http://www.mci-group.com/usa.